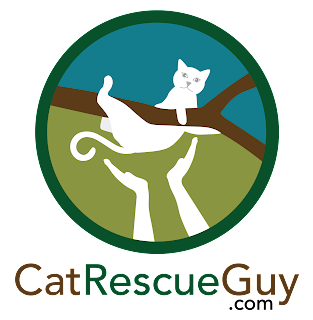 Most cat rescuers will not attempt to rescue a cat unless it has been in the tree at least one night. This requirement is reasonable because they want to make sure that the cat has an adequate opportunity to figure out how to come down on its own. Some rescuers even require two nights in the tree. I don't. It is pretty easy to tell when a cat in a tree is in distress: he will cry constantly, he will attempt to come down head first and then pull back, he will pace laterally or climb higher. If the cat or his owner is in distress, then I will attempt a rescue after only one hour in the tree. So when I got the call one morning to rescue a kitten that had been in the tree only one hour, I was readily agreeable. I trust the owner to know their cat and know when it is truly stuck. I arrived at the site to find Kitty in a very large oak tree with dense foliage that would make it difficult not only to install a climbing line, but also to climb. All of the numerous short branching limbs and leaves blocked every reasonable pathway upward and created death traps for the throw-line I would need to use to install my climbing line. To make matters worse, there were no good crotches in the tree where I could install my line. All the crotches were either V-shaped, which causes the line to get stuck, or were covered with so many small limbs and twigs that I was sure to get my throw-line stuck there. There was one crotch, however, that was a useful U-shape and in a good location, but the branches that formed that U both led up vertically in parallel and were only inches apart. It would be difficult to shoot my throw-line with my large sling-shot into that small opening from 40 feet below, but I decided to at least give it a try. To my surprise and delight, I hit the target perfectly on my first shot. So I installed my line and began climbing upward, pushing through all the foliage that surrounded me, until I was level with Kitty. Kitty is a tame, friendly, gray tabby kitten, but I was not sure how he would react to me. When I first approached him, he did not climb higher, but he did not jump in my lap either. He was cautious with me and positioned himself for an escape if needed. So I pulled out a can of food, and that gained his interest and trust. He eventually let me touch him while he ate. Normally, I would have liked put his food in a carrier and let him walk in for it. But the dense foliage of the tree made it too difficult to bring a bulky carrier with me, and I would have had difficulty positioning it next to him. The next best option for Kitty, then, was to scruff him into my gloved cat bag. In my previous rescues, I had been having difficulty scruffing cats into a gloved bag. In fact, in the most recent rescue, I actually lost control of the cat and she got out of the bag and jumped to the ground. After that experience, I decided to make a better cat bag. The bag I had been using was too small and stiff, so I found a larger and more supple one. I practiced with it and found it to be much better, but this would be the first time to use it on a real rescue. Kitty was not happy to be scruffed, and he complained loudly and fought me. But the bag worked much better, and I got him into the bag without very much difficulty. I brought him down through the gauntlet of limbs, gave him to his owner, and she took him inside to release him. He was docile as she lifted him out of the bag and into her arms. He even let me give him a couple of pats on the head without complaint. Another relieved cat. Another happy owner. I felt good. 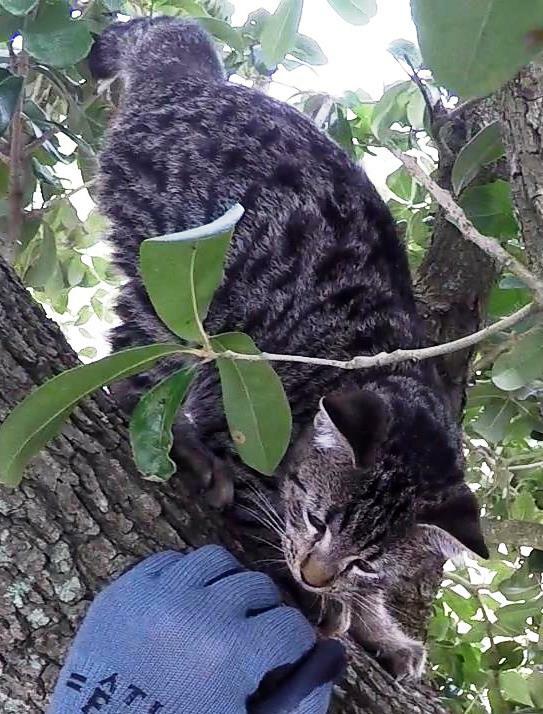 The video of the rescue is mostly obscured by the dense foliage, even though the place where I was with Kitty was much more open than the rest of the tree. I have some great close-up images of the leaves and few clear views of Kitty. Also, the limbs and leaves slapped at the camera microphone making unbearable noises throughout. I edited the audio to make it bearable, but it is still rather annoying.